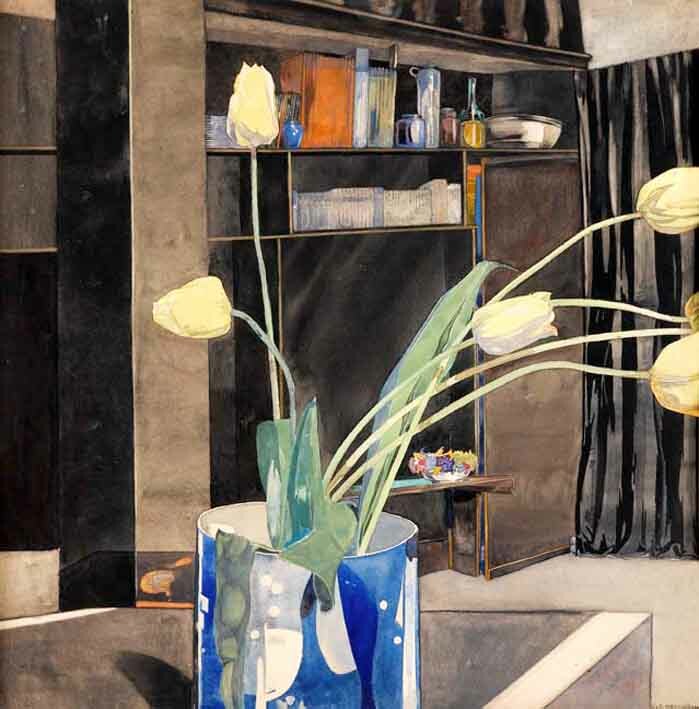 ‘Yellow Tulips’ by Charles Rennie Mackintosh, 1919, estimated at £100,000-150,000 when Lyon & Turnbull sell the collection of New Yorkers Donald and Eleanor Taffner in Edinburgh on September 7. A chance encounter over dinner in the mid 1980s with the Scottish artist Barbara Rae saw the Taffners, both native New Yorkers, introduced to the work of Charles Rennie Mackintosh and his circle. They quickly became both ardent supporters of the Glasgow School of Art and its educational activities and keen collectors of 20th century Scottish art. In a quintessential 'American dream' story, Donald Taffner (1930-2011) and his wife and business partner, Eleanor, who died in 2010, specialised in taking British format television shows to the American public. Their company DL Taffner Ltd took Three's Company (the US version of Man About The House) and The Benny Hill Show to the US and more recently, produced As Time Goes By and My Family for the BBC. Success bought an early 19th century home in Greenwich Village furnished with drawings, paintings, furniture and works of art by the Glasgow Four and permitted the creation of the Taffner Mackintosh Curator at the Glasgow School of Art, a position which assisted with the promotion of Mackintosh's masterwork and safeguarded the extensive collections owned by the school. Thanks to the Taffners' support, Glasgow Museums' Charles Rennie Mackintosh exhibition (which opened in 1996) went on tour to New York's Metropolitan Museum of Art, the Art Institute of Chicago and Los Angeles County Museum of Art, while four years later they provided the necessary funding to send one of Mackintosh's recently restored tea rooms to an exhibition at the National Gallery of Art in Washington DC. The Taffners also donated a substantial piece of Mackintosh furniture to the Hill House in Helensburgh after learning they had outbid the National Trust for Scotland at auction. More than 100-plus works with a value of over £1m will be sold - on behalf of the couple's children Karen and Donald Jnr - at Lyon & Turnbull's Edinburgh saleroom on September 7. These include both a pair of mahogany card room chairs by Charles Rennie Mackintosh, made especially for his greatest patron Miss Cranston for her home in Glasgow (estimate £20,000-30,000), and a group of the architect-designer's distinctive watercolours. Two of the highlights are Bouleternère, painted around 1925-7, from his period in the south of France and estimated at £80,000-120,000; and Yellow Tulips, a remarkable still life dated to 1919 and estimated at £100,000-150,000. Both were previously sold by Christie's: in 1989 and 1994 respectively. Elsewhere, Girl with Blue Butterflies (estimate £60,000-80,000), leads an important group of watercolours by Frances MacDonald, while works by her husband Herbert MacNair and sister Margaret Macdonald are also included in the sale alongside oils by the Scottish Colourists F.C.B. Cadell and J.D. Fergusson. One of the more unusual lots is an intriguing self-portrait by Sir John Lavery pictured alongside the child star Shirley Temple. It was after his wife's death in 1935, and at the age of 80, that Lavery went to Hollywood with the idea of painting portraits of the 'stars'. This, the solitary result, is estimated at £30,000-50,000.